Dr. Larivé questions whether there is such a thing as a European defense and security policy. 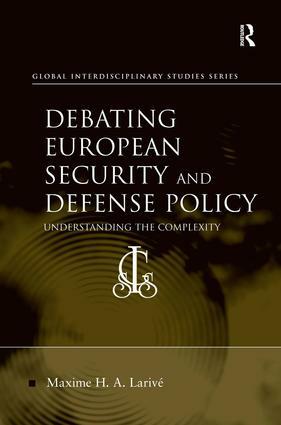 This book analyzes the integration process by clearly illustrating to the reader the two sides of the argument in order to understand the complexity of the problems in the different stages of the creation and implementation of the European defense policy. In doing so, this study asks the question of why has the process been so halting and of such limited scope? Structured in three parts: Theories, analyzing the theoretical debates raised by the positivist paradigms of neorealism, liberalism and constructivism on European security; History, reflecting on the impacts of the Cold War, American foreign policy, the 2008 economic crisis, and the evolution of European strategy; and, Actors, by looking at the role of European institutions, Member States, and the CSDP on the transformation of the European defense policy since 1998. Each chapter is composed of sub questions allowing the reader to grasp the different forces explaining the deepening or lack of the deepening process of the CSDP. Ultimately, this book offers a unique base for fostering discussion, understanding and critical thinking on the CSDP. Dr Maxime H. A. Larivé is a Research Associate at the European Union Center of Excellence at the University of Miami. His research focuses on the European Union as a global security actor. He has published several articles in peer-reviewed journals, like European Security, and renowned international magazines like the National Interest and World Politics Review. He graduated with his Ph.D. from the Department of International Studies at the University of Miami in 2012 and worked as a Jean Monnet post-doctoral Fellow at the EU Center of Excellence at the University of Miami from 2012-2013. The Global Interdisciplinary Studies Series reflects a recognition that globalization is leading to fundamental changes in the world order, creating new imperatives and requiring new ways of understanding the international system. It is increasingly clear that the next century will be characterized by issues that transcend national and cultural boundaries, shaped by competitive forces and features of economic globalization yet to be fully evaluated and understood. Comparative and comprehensive in concept, this series explores the relationship between transnational and regional issues through the lens of widely applicable interdisciplinary methodologies and analytic models. The series consists of innovative monographs and collections of essays representing the best of contemporary research, designed to transcend disciplinary boundaries in seeking to better understand a globalizing world.